The Longxiaobao restaurant group has ambitious plans to open 50 locations in China over the next three years. Which should keep Christina Luk of Lukstudio happily busy for a while. The Shanghai-based designer won so many plaudits for her sophisticated take on the traditional noodle shop in the Noodle Rack restaurant in Changsha, Hunan that she was tapped to take on Longxiaobao’s flagship eatery in the Kengo Kuma-designed Sanlitun SOHO complex in Beijing. 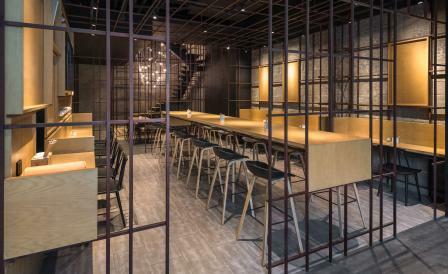 The entrance of rusted steel and copper plate details opens up into a long space that is sectioned off into three distinct dining areas by metal grid frames. The rawness of the space is accentuated by exposed concrete floors, grey slate floor tiles and wooden tables. The first section comprises of canteen like rows of long tables that cater to busy execs slurping through a rushed lunch of rice noodles with beef; the second, framed by white china pots, incorporates banquettes for more convivial gossip; while the third is anchored by Luk’s quirky installation of white draped loops that represent strands of freshly made Chinese noodles – a rather clever nod to the restaurant’s MO. The latter conceit is carried on in the upstairs dining room where, strung through with exposed light bulbs, it also doubles up as wispy see-through screens that separate tables.